A garage door is a feature that most homeowners probably can't do without, so it's probably safe to say it's a major inconvenience if yours starts acting up. If you don't know what's wrong with your garage door, don't worry. Most people have no idea what specifically is going on when there's has a problem. That's because your garage door system is fairly complex. Although the equipment may seem minimal, there are several components that have to work together to make the garage door fully functional. If even one of them is faulty, your garage door will probably malfunction. The garage door track is one of your door's most important elements. Each track runs vertically along the door opening and continues horizontally along the ceiling of your garage. It houses the roller assembly, which helps the overhead door raise and lower smoothly. After regular use over a period of time, the garage track may start to wear and adversely affect the door's operation. Immediately stop using your garage door if it goes off its track. Continuing to raise and lower the door could result in extensive damage that could end up requiring garage door replacement. We provide garage door track repair in Frisco, TX, to correct any problem. At Discount Garage Door Repair, our technicians have experience handling all types of garage door repairs, including track repair. We start the process by inspecting your overhead door to determine if one or both tracks are damaged. The entire apparatus is checked for bends, worn edges, and any other abnormality that may be causing the issue. Once we locate the specific area of concern, we'll know how to correct it. For a garage door off track, we sometimes have to straighten or replace the door panels. This is usually required when some of the panels are damaged or broken, which can affect the track performance. Sometimes the issue can be as simple as misalignment of the rollers. To fix that kind of a problem, we just pop the rollers back into place and reattach garage door. It's not always that easy, though, especially if the garage door tracks have structural damage. In cases like this, we typically have to straighten each track to make the door fully operational again. Get your garage door back on the right track with our help. 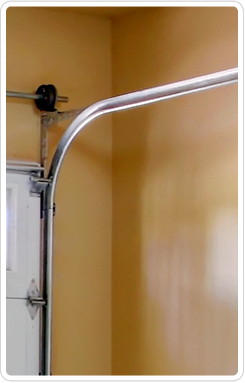 Contact us for garage door track repair that makes it easy to raise and lower your overhead door. We proudly serve Frisco, Plano, Mckinney, The Colony, Prosper, Aubrey, Lewisville, Little Elm, and Allen, TX and the surrounding areas.